The luxury condominium, Jade Ocean, is one of the most magnificent condos in the Sunny Isles area, and the lifestyle that this condominium offers to the residents is lavish, highly impressive, blissful, and very comfortable. Located on the Sunny Isles Beach, this condominium offers a sumptuous and highly desirable beachfront lifestyle to the residents, and from their residences, the residents can enjoy the mesmerizing views of the glorious beach and the endless ocean. The natural beauty of the Sunny Isles Beach is matchless and this magnificent condominium enhances this beauty to a great extent. Designed by the eminent designer and architect, Carlos Ott, this condominium is certainly, one of the most beautifully designed, splendid looking condominiums in the entire Sunny Isles area. The units of Jade Ocean Sunny Isles offer a lot of space for the inhabitants and the interior décor of the units are sure to impress and earn the appreciation of the condo buyers. If you are interested in buying the units of Jade Ocean, you may contact the real estate companies, which offer the units of this condominium for sale. This imposing condo tower is 51-story high and offers 256 capacious units with all the luxury residential features and top class amenities for the residents to enjoy a comfortable and lavish living in the condominium. 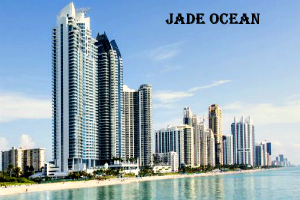 Many real estate companies are offering the units of Jade Ocean for sale. To get more details regarding the condo features, units, prices, etc., visit the websites of these notable real estate companies. The closeness to the mighty ocean, the exciting beachfront lifestyle, the grandeur of the condominium, the proximity to all the important places and attractions of Miami – all these facilities make this condominium very desirable to the condo buyers. The features of this building are fantastic and the amenities and services offered to the residents impress them thoroughly. At the entrance, there is a gorgeous three-story lobby. This palatial condominium offers a private beach club, which has cafes and cabanas for the residents to relax, enjoy, and spend their leisure time. There are infinity-edge pools around the building that make the edifice look more stunning. The residents can avail valet, concierge, and security services 24/7. Inbuilt smart home technology is there in each and every unit. The residents can enjoy the outstanding views of the surrounding area from the large, very well-decorated terraces. The units have floor to ceiling glass windows, the kitchens have Sub-Zero kitchen appliances, glass kitchen cabinets, granite countertops, etc. In the bathrooms, the residents get top-quality faucets and fixtures made by European designers, luxury bathtubs, etc., and many other amenities are there. So, to enjoy a luxurious lifestyle in a beachfront condominium, in the pleasant oceanic ambiance, buy a unit in Jade Ocean and make every day of your life as beautiful and pleasing as a reverie.